Those of us who share a passion for making cards are always on the look out for free card making ideas to stay inspired and keep up to date with the latest styles and techniques. I love creating cards for my loved ones and making them feel special with one-of-a-kind, personalised greeting cards. You can see a twinkle in their eye as they open the envelope knowing what’s inside is made just for them. Even my ten year old, football-loving nephew gets excited when he opens one of my cards. But the problem is, it’s not always easy to stay inspired. So I am constantly on the look out for new and fresh free card making ideas. Unfortunately, it can take hours to find something I like online. And if you lead a busy life like me, you’ll know those are hours we just don’t have up our sleeves. Plus, when you do find something you like and want to try making it, there are very rarely any instructions and it’s not always easy to guess how something was out together. If you do give it a go, it feels like you are just making a stab in the dark and you don’t always get the result you want. That’s why I love the free card making classes from CardMakingClassroom.com! They are stylish, easy to create and come with complete instructions on how to make them. The card classes offer a fabulous starting point for beginners and a springboard for those of you with more experience. They are so versatile and easy to adapt to your own personal style. If you want to stay inspired and stop wasting oodles of time, join CardMakingClassroom.com today and start enjoying your free card making classes. hope you enjoy my little video! Technorati Tags: Arts, Card, Crafts, Making, Stampin', Up! Stix2 offer a range of Acid Free PVA Glue Cardmaking Scrapbooking Hobby Craft. 1. Using foam tape. I love foam tape for adding that extra dimension to my cards and making elements pop. It works particularly well when layering different elements on top of each other. 2. 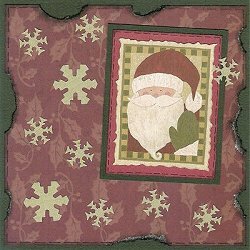 Layering different pieces of patterned paper or cardstock to create unique backgrounds. This is a fabulous card making technique that makes your design look sophisticated and advanced, even though it is very easy to do. 3. Embellishing with ribbon. Ribbon adds texture and dimension to your cards. Soft organza ribbons are perfect for formal cards like wedding cards, baby shower cards and get well cards. But, there are also hundreds of bright, funky ribbons also available for more playful and fun designs. 4. Rubbing an ink pad around the edges of the different elements making up the card. As I mentioned in a previous post, I love this effect for creating an aged or worn feel to my designs. 5. Cutting out flowers, hearts and other shapes from scrapbooking papers to create not only unique one-of-a-kind embellishments for my cards but cheap embellishments too! Scrapbooking papers offer an endless range of possibilities for creative and stylish embellishments. These are just a few of my favourite card making techniques. I look forward to sharing more of them with you. If you would like to learn more techniques, join Card Making Classroom now for free weekly card classes sent through email. My creative card making ideas are often inspired by other ideas. For example, in my last blog post I shared with you a teddy bear card idea in order to demonstrate how effective it is to ink around the edges of the different elements of your card. I created an aged, almost treasure-map like feel to my card with some yellow patterned paper and this technique. Click here to view the Teddy Bear Card. I have now used the exact same idea for a card to create a completely new and original card. I have replaced the teddy bear with Santa Claus and changed the colours to a Christmas theme. I have also replaced all the small circles with snowflakes for a more festive feel. As you can see, I have used the same technique to create my background – a torn piece of patterned paper which has been inked with brown ink all around the edges. Only this time, the darker colours of the card make it appear even more aged and even a little burnt around the edges. For a really aged effect, I could have also crumpled up the paper before gluing it on. Creative card making is easy and so much fun. All you need is an idea that you can adapt to suit your own style, personality and tastes. As you can see above, one simple idea like my teddy bear card, can be quickly transformed into something completely unique. This card was featured in one of the free creative card making classes by CardMakingClassroom.com! Card Making Classroom offers free weekly card classes through email. All come with full instructions and are so easy to tweak to your own designs. One of my favourite card making ideas is to use an ink pad around the edges of the different pieces that make up my card. It softens the edges and blurs the different elements together. This technique can also be used to create a worn, aged or weathered effect. It’s very easy to do. All you need is a small ink pad. Choose a colour that compliments your design. I will often use brown inks as they suit almost any colour scheme, but any colour will do. Lightly rub the ink pad along the edges of the piece you have chosen to ink to give an uneven, smudged appearance. Don’t worry about making it perfect – the imperfections are what makes this card making idea so effective. Make sure you allow plenty of time for the ink to dry before you glue anything into place. You don’t want to accidentally smudge the ink somewhere you don’t want it. In this card, I inked all the way around the edges of the yellow paper with a brown ink. I then very lightly inked around the edges again with a dark brown ink to give it an almost burnt outline. It created an aged, almost treasure-map like feel to my card. This card was one of the free card making ideas offered by CardMakingClassroom.com! Card Making Classroom offers free weekly card classes through email. They come with full instructions and are so easy to create. 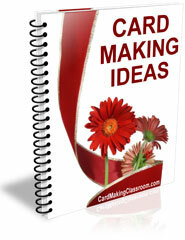 Discover the secrets to creating sensational handmade cards quickly and easily every time with Card Making Classroom’s free Card Making Ideas Book and free card making classes. Take your card making to the next level while having mountains of fun! Click here to join your free classes today! anne Arts Card card making Card Making Ideas Card Making Techniques copics Craft Crafts Creative Creative Card Making distressing with ink flower soft Free Card Making Hobby HP interactive lizzie Making MaryAnn mov023 Combine paper crafts Scrapbooking Stampin' tutorials Up!